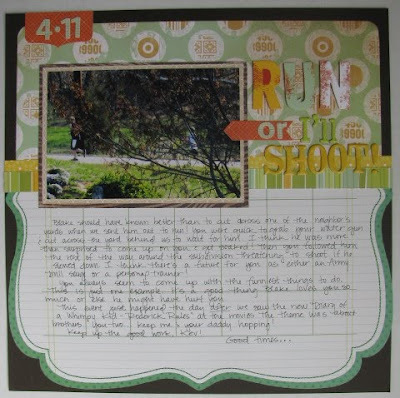 I have more layouts to share that I completed over spring break. I knew my April box from Studio Calico was in the mail and I was feeling guilty about not using my March supplies yet. 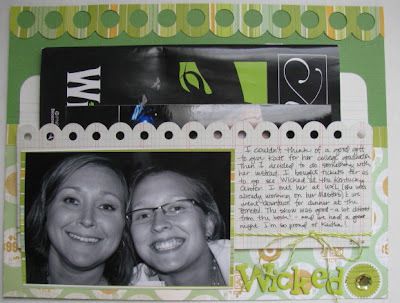 I pulled out my box with the March kit, a couple add-ons and more SC paper and got to work. When I first saw the yellows and greens in the papers, I knew I wanted to pull out some of my farming photos. My dad has John Deere tractors. 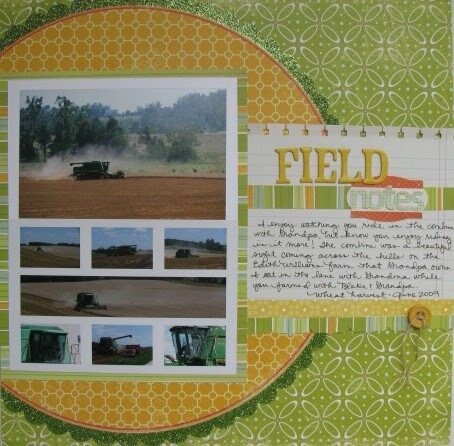 I usually find it hard to scrap my farm photos, but several layouts quickly came together with my box of March goodness. 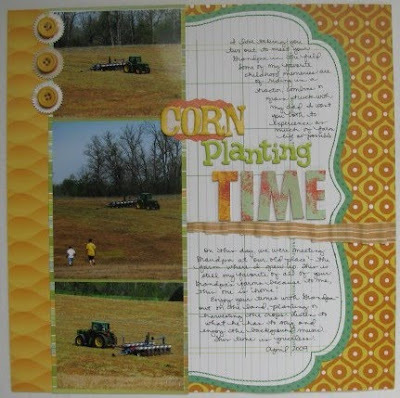 "Corn Planting Time" quickly became a new favorite layout of mine. I am happy to have this moment of my boys walking across the field (where I grew up) to meet my dad in the tractor. I remember doing this so many times myself as a child. Even though I turned the KI calendar paper on its side the lines of the paper are sideways, I still had plenty of room to journal. I mixed the Cosmo Cricket chipboard alphas with my favorite shade of green (ever!) Thickers and hand cut letters from one of the Studio Calico papers. Finally, I put my new Martha Stewart punch to good use and accented the shapes with buttons from the kit. "Field Notes" looks a little similar, but instead of planting corn, the boys and dad were harvesting wheat. "Run or I'll Shoot!" used newly printed (used 1 hour at Walgreens!) photos to tell a story that I never want to forget. We sent Blake out to run for his daily exercise and noticed he had cut across a yard instead of making the full loop. Kevin, armed with a full water gun, cut across the yard behind us to wait for his unsuspecting brother. When Blake passed him, Kevin followed the rest of the way around threatening to shoot him if he slowed up. I love these boys! Next, it was time to get girly. 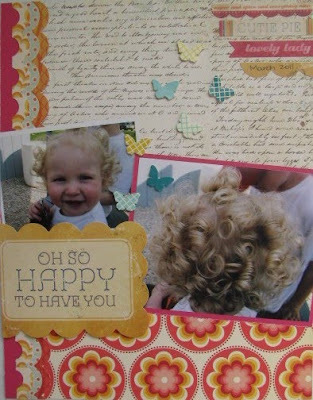 New photos of Reese worked perfectly with the more feminine papers and butterfly embellishments from an add-on. I love her curls!!! I'm so not the butterfly person...but I did like using these little ones by Cosmo Cricket. I thought the colors in the Cosmo Cricket circle paper fit the colors in boys' service project photos perfectly. I just didn't get too creative with my title. Even though they were bagging trees, I thought the flower and butterfly embellishments worked, too. Loved all of the green in this kit. (It's my favorite color, you know.) Green reminded me of Wicked. I went last May with my sister. The KI Memories folder/pocket was perfect for the playbill and extra photos. This kit was perfect for outdoor photos. I went down memory lane a bit with this one. The photos are nearly five years old. A lot has changed in five years. My boys have really grown. Sometimes just a grouping of things in a corner really finish off a layout. Even with all of these layouts, I still have a great supply of products. And, I've yet to touch the April box that arrived during spring break. I'm starting to think I should pass on add-ons for May. I probably shouldn't even go to the SC site around reveal time! The notebook punch on the "notes" layout is perfect. And the MS punch with the buttons--I'll be using that idea.